WPH Race 4 Eight pros David Fink and Sean Lenning made the stunning four-hour drive from Tucson to Pinetop, AZ to play a Junior WPH fundraiser exhibition match and pro-am doubles with the local handball community. Lenning and Fink inspired the locals with brilliant shot making and exciting comebacks. Lenning battled back from a first game deficit to score eight unanswered points to close out the game, 15-10. Lenning was on the verge of a two-game victory, leading 14-12 in game two, but Fink forced a tiebreaker with five consecutive kill shots. Lenning trailed 4-1 in the decider but rallied with six ace serves and four kills shots, clinching the match 15-10, 14-16, 11-4. 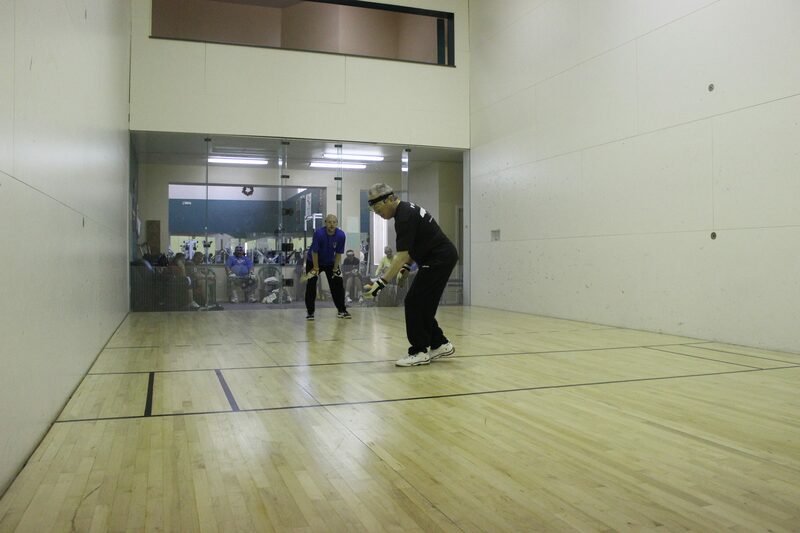 Fink and Lenning played over a dozen games of pro-am doubles with the handball regulars at the Bodyworks Handball Club, teaming up with different players in virtually each game. The local press sent a reporter to cover the WPH Pinetop Fun Day, as players posed for pictures and explained the benefits of the greatest lifetime sport. Thank you to Mike Park for the incredibly generous donation to Junior WPH and congratulations to Mike and his wife on their 50th wedding anniversary! If your handball community would life to host a WPH Fun Day Junior WPH Fundraiser in your city, please contact WPH Youth and Donor Development Director David Fink at fink@race4eight.com. Junior WPH held over 600 junior handball clinics across the world in 2014 and plans on an even bigger 2015. Please consider making a tax-deductible donation today and supporting the growth of the game. 100% of the donations received by the WPH go towards junior handball development. Donate on-line at www.thehandballstore.com, send your generous gifts through PayPal (extremehandball@cs.com) or by mailing checks to: WPH, 3561 E. Sunrise Dr. Suite 125, Tucson, AZ, 85718.